Alana Lentin’s idea that “The holocaust was Europe’s tragedy. Colonialism someone else’s.” (Lentin 2008: 495) synthetically captures a widely accepted yet rarely spoken assumption. Far from opposing the two “tragedies”, Lentin’s claim calls for a consistent reflection not only on Europe’s selective memories, but also about contemporary approaches to social heterogeneity. Outside the UK, after WWII, both policy and academic discourses have largely been ignoring the concept, and more generally the language, of race. Framing social heterogeneity in ethnic or cultural terms, deploying for instance the concepts of “multiethnic” and “multicultural” societies, has gained a significant consensus. More recently, the idea of “superdiversity” (Vertovec 2007) highlighted the need of considering different forms of diversity conjointly, such as class positions, spatial distributions, gender and age profiles, etc. Some have argued that neglecting race prevents questioning certain assumptions that may lay behind racism, and talked about "racism without races" (Balibar 1991). Others have warned against the reification that race would acquire among the public, if used in policy and/or academic discourse (Rivera 2011). Recent political events have emphasized the debate: for example, the summer 2008 Italian Government's count and collection of biometric data of Roma, and the spring 2013 French National Assembly’s decision to remove the words "race" and "racial" from national law books. 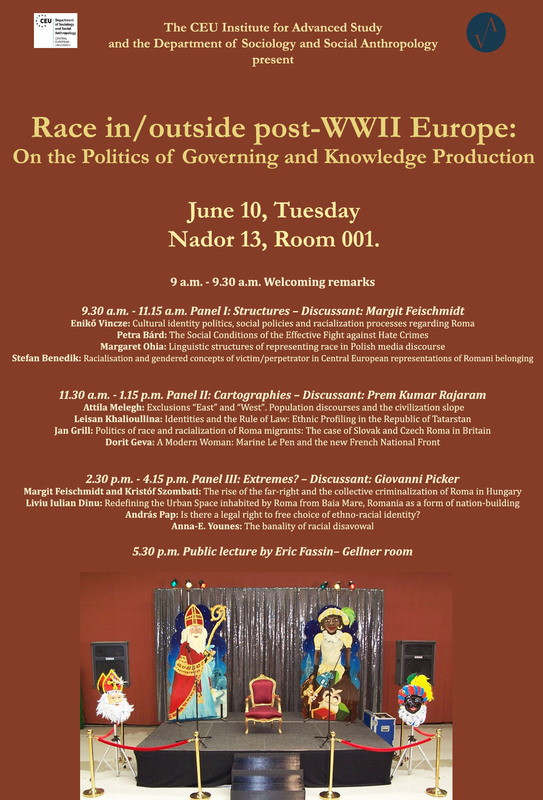 Within this framework, the present workshop raises the fundamental question of how to better approach social heterogeneity in Europe, focusing in particular on policy (the politics of governing) and scholarship (the politics of knowledge production). It aims to create a convivial dialogue among junior and senior scholars from a variety of disciplinary backgrounds. Interventions crossing disciplinary boundaries within the social sciences and the humanities are especially welcome.